DMINLGP.com | Christians are not redemptive. 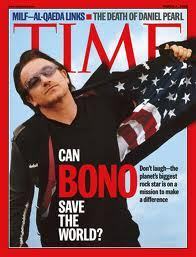 “Can Bone Save The World?” Another way to ask the question might be; is Bono redemptive? I have my hunch, but I have another story to share about my introduction to Bono. Now, I had listened to the music of the band U2 here and there, but a number of years before I came to the United States, a group of my friends and I in Kampala (the capital city of Uganda) were working with a group of American missionaries who had flown in for a brief mission trip. After a long day’ work, we thought everyone was dead tired, but we were about to find out as the day coiled. One of our American friends received a conformation that Bono had arrived in Uganda and was lodging at one of the high end hotels. You would think a spirit of revival went through our missionary friends’ to call them to a “come to Jesus meeting”! with Bono. Right from the start, Hunter had my attention. Even though he is writing as a sociologist, I was eager to engage with the material from both an academically theological and personal level. Indeed, mine was a quest of “faith seeking understanding” as McGrath puts it and a draw to grasp some more about that which is personal like the story of my missionary friends’ meeting Bono. I contend that the dominant ways of thinking about culture and cultural change are flawed, for they are based on both specious social science and problematic theology. In brief, the model on which various strategies are based not only does not work, but it cannot work. On the basis of this working theory, Christians cannot “change the world” in a way that they, even in their diversity, desire. Is it idealistic to think and hope that Bono who is a cultural symbol of high celebrity status could change and save the world? Some might say yes and others no. Personalities like Bono do good works and have helped many people through music and other advocacy attempts. Yet, Bono and his band are also an astute business empire which operates from the center. How can an individual concerned with show business at its most powerful zenith effectively change and save the world? Hunter affirms “The individuals, networks and institutions most critically involved in the production of a culture operate in the “center” where prestige is the highest, not on the periphery, where status is low.” It seems difficult to “create space” for people on the periphery, if the so called world changer flies so high and mighty. …. Christians, at their best, will neither create a perfect world nor one that is altogether new; but by enacting shalom and seeking it on behalf of all others through the practice of faithful presence, it is possible, just possible, that they will help to make the world a little bit better.